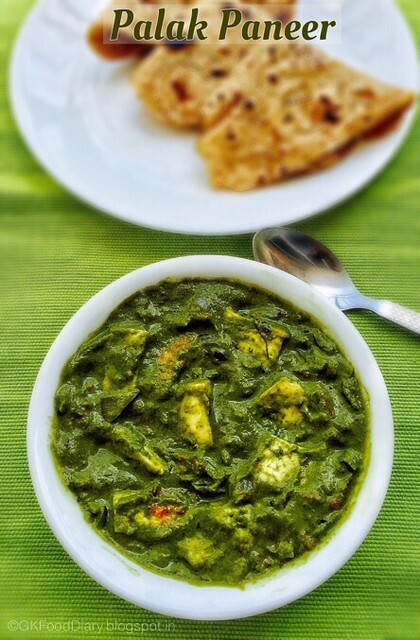 Palak paneer recipe with step by step pictures – It is a famous North Indian Punjabi recipe made with cooked Indian spinach and fried paneer. It has a smooth and creamy consistency and the paneer cubes will melt in mouth while eating. This gravy is even apt for greens haters and they will change their mind once they tastes this. 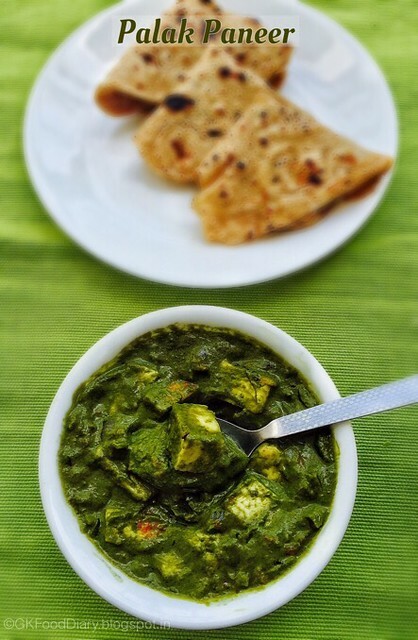 Palak paneer goes well with rotis/chapati or even jeera rice. 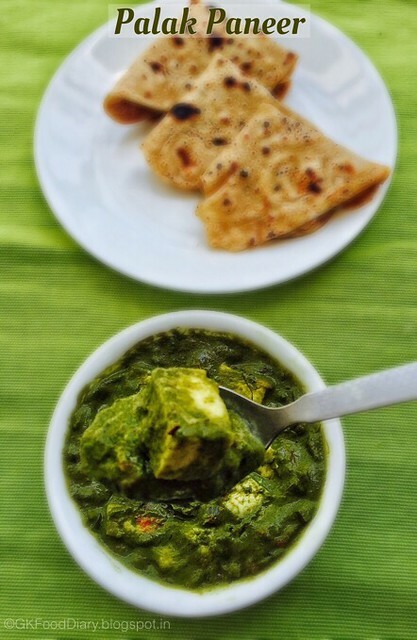 To me, the perfect palak paneer should retain its green color so added green chillies for spiciness instead of red chilli powder. Adding a pinch of sugar also helps retain the green colour of palak. 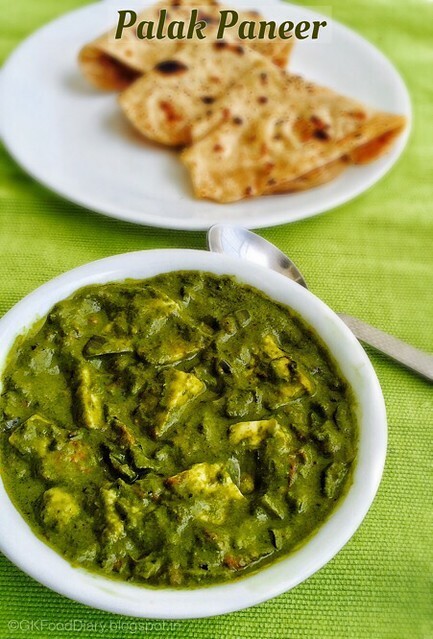 Let’s check how to make this easy palak paneer recipe. Chop the onions, tomatoes finely and split the green chilles. Set aside. Take the palak leaves from the stem and wash it twice in running water. Keep it ready. Saute the cleaned palak leaves and green chillies in ½ tsp of oil until the leaves shrink in volume. Cool it down. 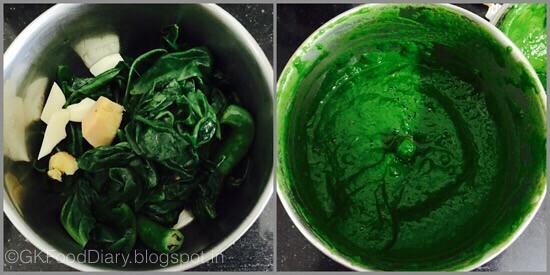 Take the fried palak leaves and green chillies to a blender along with ginger and garlic. Grind everything to a smooth paste and keep aside. Cut the paneer into cubes and fry them in a tsp of oil until golden brown. Keep it immersed in warm water till use. Heat ghee in a pan and add sahi jeera. Add bay leaves, cinnamon, cloves, & cardamom. Fry them until sahi jeera cracks. Add onions and saute them well.Once the onions becomes transparent, add the tomatoes along with turmeric powder, red chilli powder, garam masala powder and salt .Fry the tomatoes until it becomes mushy and soft. 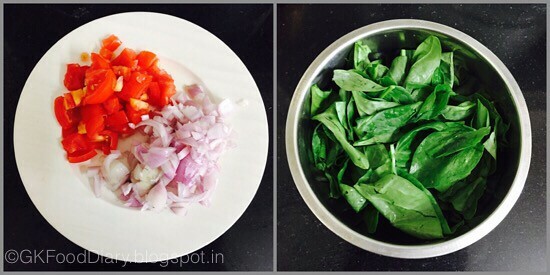 Once the tomatoes becomes mushy and soft, add the palak puree along with sugar. Mix everything together. 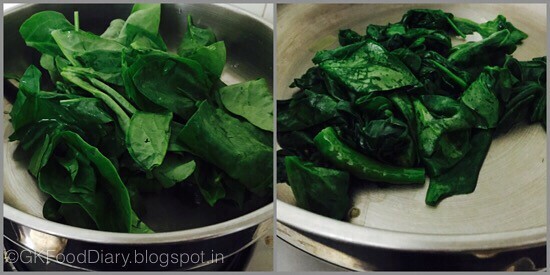 Add ½ cup of water and cook the gravy for five minutes until the palak slightly changes it colour. Once the raw smell of palak leaves, add kasuri methi and give a quick stir. Then add fresh cream to the boiling gravy. Mix well and cook the gravy for 2 minutes in low medium flame. Now add the fried paneer pieces to the gravy and mix slowly. Boil the gravy in medium low flame for three minutes. Switch off the flame once done. 1. Chop the onions, tomatoes finely and split the green chilles. Set aside. Take the palak leaves from the stem and wash it twice in running water. Keep it ready. 2. Saute the cleaned palak leaves and green chillies in 1/2 tsp of oil until the leaves shrink in volume. Cool it down. 3. 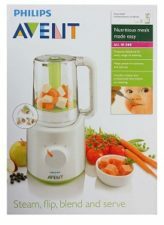 Take the fried palak leaves and green chillies to a blender along with ginger and garlic. Grind everything to a smooth paste and keep aside. Cut the paneer into cubes and fry them in a tsp of oil until golden brown. Keep it immersed in warm water till use. 1. Heat ghee in a pan and add sahi jeera. Add bay leaves, cinnamon, cloves, & cardamom. Fry them until sahi jeera cracks. Add onions and saute them well.Once the onions becomes transparent, add the tomatoes along with turmeric powder, red chilli powder, garam masala powder and salt .Fry the tomatoes until it becomes mushy and soft. 2. Once the tomatoes becomes mushy and soft, add the palak puree along with sugar. Mix everything together. 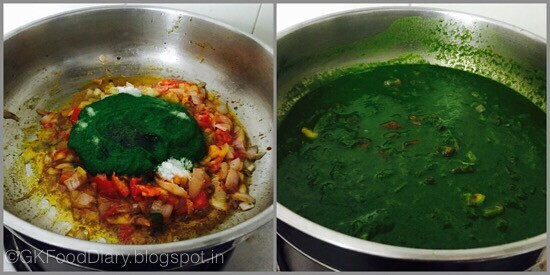 Add 1/2 cup of water and cook the gravy for five minutes until the palak slightly changes it color. 3. 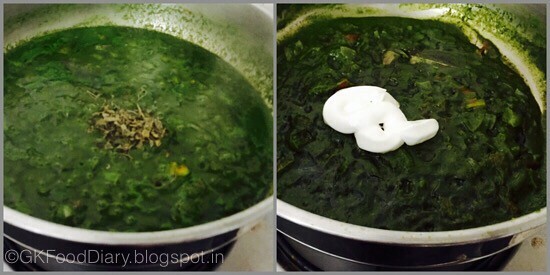 Once the raw smell of palak leaves, add kasuri methi and give a quick stir. Then add fresh cream to the boiling gravy. Mix well and cook the gravy for 2 minutes in low medium flame. 4. Now add the fried paneer pieces to the gravy and mix slowly. Boil the gravy in medium low flame for three minutes. Switch off the flame once done. 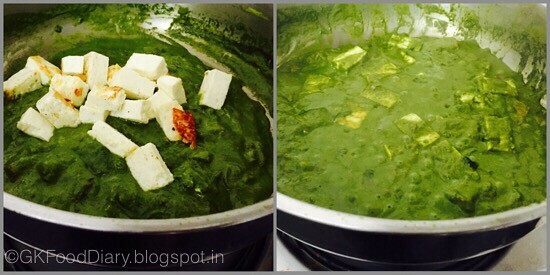 The yummy palak paneer is ready! Serve it with chapati/roti. Instead of sautéing the palak leaves, you can boil them in a cup of water for five minutes and can proceed with the remaining steps. This is a medium spicy curry with the above mentioned ingredients. 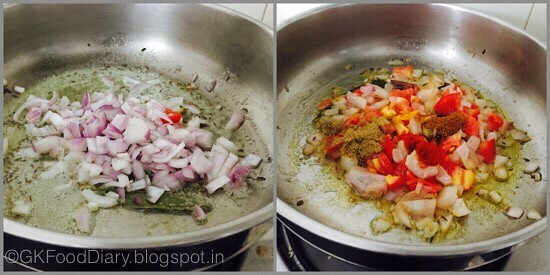 If you want the gravy to be more spicy,increase the green chilles.